1 Reds Won 1 0 1.000 1 Jeremy Hellickson Jeremy Hellickson Jeanmar Gomez Hernandez lead off the game with homer and Kendrick went 3-for-5 in 4-3 win. 2 Reds Lost 1 1 .500 0 Jerad Eickhoff Jerad Eickhoff Eickhoff battled Finnegan through first six innings before allowing 2 runs in 7th in 2-0 loss. 3 Reds Lost 1 2 .333 -1 Clay Buchholz Adam Morgan Daniel Nava homered in his first two AB's as a Phil, but Buchholz struggled through 5 innings, allowed 4 runs, and blew a 4-1 lead. Adam Morgan allowed 3 more, including a homer to pinch-hitting relief pitcher Michael Lorenzen in 7-4 loss. 4 NATS Lost 1 3 .250 -2 Vince Velasquez Vince Velasquez Velasquez fanned 10 but allowed 2 homers in 4 innings in home opener and Werth added a 3-run homer off Joely Rodriguez in 7-6 loss. Altherr and Galvis also homered in rally that fell short. 5 NATS Won 2 3 .400 -1 Aaron Nola Aaron Nola Phils score 12 times in the first inning, the most ever in the first inning in club history and one shy of team record for an inning set in 2003 in 17-3 win. 6 NATS Won 3 3 .500 0 Jeremy Hellickson Jeanmar Gomez Hellickson left with injury after five inning and Phils built 3-0 lead before Gomez blew save by allowing 3-run homer in ninth, but Hernandez bloop hit in bottom of ninth gave Phils win. 7 METS Lost 3 4 .429 -1 Jerad Eickhoff Edubray Ramos Eickhoff goes 7 innings and left with 2-2 tie. Ramos threw behind Cabrera in eighth, Mackanin was ejected, and Rodriguez allowed 2-run homer. Stassi collected first hit with 9th inning homer but Phils lost 4-3. 8 METS Lost 3 5 .375 -2 Clay Buchholz Clay Buchholz Buchholz last 2.1 and allows 6 runs before leaving with right forearm strain and Cespedes hits 3 of 7 Mets homers in 14-4 loss. 9 METS Lost 3 6 .333 -3 Vince Velasquez Vince Velasquez Velasquez last just five innings and allows 5 runs and Franco's grand slam were only runs scored in 5-4 loss and sweep to Mets. 10 Nats Lost 3 7 .300 -4 Aaron Nola Jeanmar Gomez Nola pitches strong five innings with one run, but Phils blew 2-1 lead and Gomez surrendered walk-off hit in 10th. 11 Nats Won 4 7 .364 -3 Jeremy Hellickson Jeremy Hellickson Joaquin Benoit Hellickson goes 7, Cesar Hernandez hit game-winning two-run homer, and Benoit earned first save in 4-2 win. 12 Nats Lost 4 8 .333 -4 Jerad Eickhoff Joaquin Benoit Down 3-1, Phils score 3 times in 8th and 9th to take 4-3 lead, but Benoit allowed 3-run walk-off homer to Bryce Harper in 6-4 loss. 13 Mets Won 5 8 .385 -3 Zach Eflin Luis Garcia Phils tie game 2-2 in 8th, although should have taken lead if Galvis ran to first on error, but scored 4 times in 10th for 6-2 win. 14 Mets Lost 5 9 .357 -4 Vince Velasquez Jay Bruce hit 3-run homer off Velasquez and another homer in the 8th to give Mets 5-4 win. 15 Mets Won 6 9 .400 -3 Aaron Nola Aaron Nola Hector Neris Phils score 5 runs in first three innings against Syndergaard and Rodriquez tossed two of 4 scoreless innings by bullpen in 6-4 win. 16 BRAVES Won 7 9 .438 -2 Jeremy Hellickson Jeremy Hellickson Hector Neris Hellickson went 7 innings and allowed 2 runs, Hernandez had 3 hits, and Phils got 11 hits off Colon, while Neris notched second straight save to end 7-game losing streak against Braves. 17 BRAVES Won 8 9 .471 -1 Jerad Eickhoff Jeanmar Gomez Phils held 2-1 6th inning lead into ninth, but Ramos blew save. The Phils committed two errors and allowed a run in 10th, but Franco hit bases loaded walk-off single for 4-3 win. 18 BRAVES Won 9 9 .500 0 Zach Eflin Joely Rodriguez Eflin went 7 innings and allowed one run, while Hernandez, Altherr, and Herrera hit back-to-back-to-back homers in 8th as Phils sweep Braves. 19 MARLINS Won 10 9 .526 1 Vince Velasquez Vince Velasquez Franco's grand slam in 5th one of three homers in 7-4 win. 20 MARLINS Won 11 9 .550 2 Jeremy Hellickson Jeremy Hellickson Hector Neris Hellickson improved to 4-0 with six innings of one run ball and Stassi's sixth inning triple plated winning run in 3-2 win for Phils' 6th straight win. 21 Dodgers Lost 11 10 .524 1 Jerad Eickhoff Jerad Eickhoff Phils took 2-0 lead in 3rd, but Eickoff allowed 5 runs in the next four innings in 5-3 loss to end 6-game winning streak. 22 Dodgers Lost 11 11 .500 0 Zach Eflin Hector Neris Eflin with a 7-inning gem and two runs allowed and Stassi's 3-run homer in 4th helped Phils to a 5-2 lead in 9th, but Neris allowed three straight homers and Dodgers won on ball that trickled off Franco's glove. 23 Dodgers Lost 11 12 .478 -1 Nick Pivetta Nick Pivetta Pivetta worked in and out of trouble with just 2 runs in 5 innings, but 3-run homer off Gomez in 6th helped Dodgers to 5-3 and series sweep. 24 Cubs Won 12 12 .500 0 Vince Velasquez Vince Velasquez After rain delay, Joseph 3-run homer highlighted 4-run first and Phils scored 7 runs in first two innings and Altherr knocked in 3 runs in 10-2 win. 25 Cubs Lost 12 13 .480 -1 Jeremy Hellickson Jeremy Hellickson 2 out walk by John Lester off Hellickson began 4-run burst in 4th in 8-3 loss. 26 Cubs Lost 12 14 .462 -2 Jerad Eickhoff Jerad Eickhoff Eickhoff and bullpen allow 4 runs in 6th and Phils blow 3-1 lead in 5-4 loss. 27 Cubs Lost 12 15 .444 -3 Zach Eflin Joely Rodriguez Phils chase Lackey after 5 innings and Eflin pitches 7 innings, but Benoit blows lead in 8th. Phils lose in 13th with walk-off error when Galvis's errant throw couldn't complete double play. 28 NATS Lost 12 16 .429 -4 Nick Pivetta Nick Pivetta Strasburg homers, Pivetta allows 4 runs in 5 innings, and Phils lose 4th straight, 4-2. 29 NATS Lost 12 17 .414 -5 Vince Velasquez Vince Velasquez Velasquez last 7 innings, but allows 2 homers, the last a 3-run blast in 6th after Saunders lost ball in lights and Phils lose 6-2. 30 NATS Won 13 17 .433 -4 Jeremy Hellickson Hector Neris Hellickson allowed 5 runs in 4.2 innings and Phils were behind 5-2 in the 8th, but Altherr's pinch-hit 3-run homer tied it and Phils won in 10th on walk-off sac fly. 31 M'S Lost 13 18 .419 -5 Jerad Eickhoff Hector Neris Phils took two 4-run leads with back-to-back homers from Saunders and Joseph for 4-0 lead and 3-run-homer from Altherr to take 9-5 lead, but Eickhoff and bullpen blew both in 10-9 loss. Carlos Ruiz returnded for first time and pinch-hit. 32 M'S Lost 13 19 .406 -6 Zach Eflin Joaquin Benoit Altherr's homer tied game at 3, but Benoit allowed 5 runs in 7th and Ruiz knocked in 4 as Phils lost 11-6. 33 Nats Lost 13 20 .394 -7 Nick Pivetta Edubray Ramos Up 4-0, Pivetta allowed 4 runs in the fifth and Harper hit walk-off homer in bottom of ninth in 6-4 loss. 34 Nats Won 14 20 .412 -6 Jeremy Hellickson Joaquin Benoit Down 3-1 in 9th in first game of double-header, Altherr homered and Phils scored two more runs to take 4-3 lead and held on for win. 35 Nats Lost 14 21 .400 -7 Vince Velasquez Pat Neshek Leading 4-3 in the 8th Neshek allowed his first runs of the year on a 2-run homer off left field fair pole in 6-5 loss and Phils split double-header. 36 Rangers Lost 14 22 .389 -8 Jerad Eickhoff Jerad Eickhoff Phillies couldn't master Darvish and Eickhoff took his 4th loss after a solid 3 run (2 earned), 6 inning outing. 37 Rangers Lost 14 23 .378 -9 Zach Eflin Zach Eflin Eflin allowed 7 runs in 4 innings in 9-3 loss. 38 Rangers Lost 14 24 .368 -10 Nick Pivetta Joely Rodriguez Pivetta held Rangers scoreless, but failed to finish fifth inning and Joely Rodriguez became first Phillies pitcher to allow 7 or more runs in less than an inning since Hector Mercado in 2002 in 8-4 loss. 39 Pirates Won 15 24 .385 -9 Jeremy Hellickson Jeremy Hellickson Hellickson allows 2 runs (1 earned) in 6 innings before leaving with lower back injury. Rupp's 3-run homer finished the scoring in 7-2 win. 40 Pirates Lost 15 25 .375 -10 Vince Velasquez Vince Velasquez Velasquez stumbles in 4-run sixth and Phils lose 6-3. 41 Pirates Lost 15 26 .366 -11 Aaron Nola Edubray Ramos Nola eased through 7 innings of one-run ball in his return from DL, but Phils shutout 1-0. 42 ROCKIES Lost 15 27 .357 -12 Jerad Eickhoff Jerad Eickhoff Phillies manage just 3 hits and Eickhoff allows 4 runs in 6 innings as Phils lose 8-1. 43 ROCKIES Lost 15 28 .349 -13 Zach Eflin Zach Eflin Eflin allows 8 runs in 6 innings and Phils scored twice in 8-2 loss. 44 ROCKIES Lost 15 29 .341 -14 Jeremy Hellickson Jeremy Hellickson Hellickson allows 7 runs in the third inning, Phils don't get first hit until 5th inning and finish with 3 total in 7-2 loss. 45 ROCKIES Won 16 29 .356 -13 Vince Velasquez Jeanmar Gomez Velasquez allows 1 run in five innings, bullpen pitches five scoreless, and Joseph hits homer and walk-off single in 2-1 win in 11 innings. Herrera strikes out in all 5 plate appearances. 46 REDS Lost 16 30 .348 -14 Aaron Nola Aaron Nola Phils muster just 1 hit in 8 innings against Adleman and Nola allows 5 runs in 6 innings, while 9th inning rally falls short in 5-2 loss. Mackanin holds closed door meeting after game. 47 REDS Won 17 30 .362 -13 Jerad Eickhoff Hector Neris Tommy Joseph hits solo homer and walk-off single in bottom of 9th and bullpen tosses 3.2 scoreless innings in 4-3 win. 48 REDS Lost 17 31 .354 -14 Zach Eflin Zach Eflin Eflin gives up 7 runs in five innings and Phils lose 8-4 and lose 9th straight series. 49 Marlins Lost 17 32 .347 -15 Jeremy Hellickson Jeremy Hellickson Phils get one hit through six innings and Hellickson allows 4 runs in 6 innings and Phils lose 4-1. 50 Marlins Lost 17 33 .340 -16 Vince Velasquez Vince Velasquez Velasquez left in the second inning with an elbow injury after just 19 pitches and Phils were crushed 7-2 by Marlins. 51 Marlins Lost 17 34 .333 -17 Aaron Nola Aaron Nola Nola allows 4 runs in 3 innings and Phils score just 2 runs in 10-2 loss and get swept by Marlins. 52 GIANTS Lost 17 35 .327 -18 Jerad Eickhoff Jerad Eickhoff Eickhoff couldn't finish the third inning with 5 runs allowed and 5 walks (including 2 to opposing pitcher) in 10-0 loss. 53 GIANTS Won 18 35 .340 -17 Ben Lively Ben Lively Ben Lively pitched 7 innings of one-run, 4-hit ball in major league debut and Phils break 5-game losing streak with 5-3 win. 54 GIANTS Won 19 35 .352 -16 Jeremy Hellickson Pat Neshek Hector Neris Franco's homer give Phils lead in 8th, Galvis homers twice, and Herrer goes 3-for-4 with 3 RBI in 9-7 win. 55 Braves Won 20 35 .364 -15 Nick Pivetta Nick Pivetta Herrera doubled twice and homered, becoming the first Phillies since at least 1913 with at least two doubles in three straight games. Joseph and Altherr also homered and Phils scored 11 times in 11-4 win for Pivetta's first MLB win. 56 Braves Won 21 35 .375 -14 Aaron Nola Aaron Nola Pat Neshek Nola lasted 8 innings (first starter to throw a pitch in the 8th), Herrera doubled again, and Kendrick homered. Neris struggled in 9th and was lifted for Neshek, who recorded first save in 3-1 victory. 57 Braves Lost 21 36 .368 -15 Jerad Eickhoff Jerad Eickhoff Eickhoff moved to 0-7 with a 3-run, 5 inning performance, Morgan, Rodriguez, and Garcia allowed total of 9 runs, and Blanco came in to pitch 8th in 14-1 loss. 58 Braves Lost 21 37 .362 -16 Ben Lively Ben Lively Lively with 7 inning, 3 run outing, but Phils get just 3 hits off Dickey in 3-1 loss. 59 Cardinals Lost 21 38 .356 -17 Jeremy Hellickson Jeremy Hellickson Altherr went 3-for-4 with a triple and two doubles, but the Phils wasted opportunities. Down 3-2 in 9th, they couldn't get Altherr home from 3rd with one out in loss. 60 Cardinals Lost 21 39 .350 -18 Nick Pivetta Nick Pivetta Phils shutout 7-0 with dominant performance by Carlos Martinez, while Pivetta's 35 pitch, 4-run 4th limited him to five innings. 61 Cardinals Lost 21 40 .344 -19 Aaron Nola Aaron Nola 3-run homer off Nola in fifth gave Cards lead for good, bullpen allowed 3 more runs, and two-run rally in ninth fell short in 6-5 loss. 62 Red Sox Lost 21 41 .339 -20 Jerad Eickhoff Casey Fein Phils scored 4 in first and after blowing lead took a 5-4 lead, but homer off Benoit tied again in 8th and Fein allowed walk-off hit to Pedroia in 11th. 63 Red Sox Lost 21 42 .333 -21 Ben Lively Luis Garcia Altherr hit 2-run homer and Lively allowed just 3 runs in 7 innings, but they lost in the 12th on a walk-off single against Luis Garcia. 64 RED SOX Lost 21 43 .328 -22 Jeremy Hellickson Jeremy Hellickson In Ruben Amaro's return to Philly, Hellickson put team down 5-0 after two innings. Altherr homered, but Phils lost seventh straight. 65 RED SOX Won 22 43 .338 -21 Nick Pivetta Pat Neshek Hector Neris Pivetta throws 7 shutout innings with 9 strikeouts, and Phils take 1-0 lead in 8th with RBI double and Phils hold on for 1-0 win. 66 DBACKS Lost 22 44 .333 -22 Aaron Nola Aaron Nola After not recording their first hit until 4th, Phils took 4-2 lead with 2-run double by Franco and homer by Rupp, but Nola charged with 3 runs in 7th in 5-4 loss. 67 DBACKS Lost 22 45 .328 -23 Jerad Eickhoff Edubray Ramos Eickhoff battles through 6 innings with one run allowed, Altherr gunned down a runner in the 6th, but Ramos and Fein combine for 4 runs in 7th and Phils lose 5-1. 68 DBACKS Lost 22 46 .324 -24 Ben Lively Jeanmar Gomez Homers by Altherr and Franco, plus a go-ahead RBI in sixth by Kelly gave Phils 4-3 lead, but Neris blew lead in 9th and Gomez allowed homer in 10th in 5-4 loss. 69 CARDS Lost 22 47 .319 -25 Jeremy Hellickson Edubray Ramos Hellickson pitches seven strong innings with 1 run and took 1-1 tie into extra innings, but Ramos and Fein allow 7 runs in 11th for 7-1 loss. 70 CARDS Lost 22 48 .314 -26 Nick Pivetta Edubray Ramos Phils take 5-0 lead and a 5-3 lead into 8th, but Benoit allows run in 8th, Neris blows lead in 9th, and Phils waste chance in bottom of 9th when Herrera runs through stop sign at third. Ramos and Morgan allow 2 in 10th in 7-6 loss. 71 CARDS Won 23 48 .324 -25 Aaron Nola Aaron Nola Nola allows just one run in 7.1 innings, and Joseph homered and knocked in 3 in 5-1 win to end 5 game losing streak. 72 Dbacks Won 24 48 .333 -24 Mark Leiter Mark Leiter Leiter pitches 6 shutout innings in first MLB start and homers by Franco and Joseph help Phils to 6-1 win. 73 Dbacks Lost 24 49 .329 -25 Ben Lively Ben Lively Lively hits 2-run homer at plate, but allows 5 runs in 5.1 innings. Milner allows 1 run in debut in 6-2 loss. 74 Dbacks Lost 24 50 .324 -26 Jeremy Hellickson Edubray Ramos Hellickson allows 1 run in six inning, but Phils scores just once and Ramos earns his 7th loss after allowing walk-off hit in 2-1 loss in 11th. 75 Dbacks Lost 24 51 .320 -27 Nick Pivetta Nick Pivetta Pivetta allows 7 hits, 5 walks, and 6 runs in 2.2 innings and Phils muster just 5 hits in 6-1 loss. 76 Mariners Won 25 51 .329 -26 Aaron Nola Aaron Nola Nola pitches 7 innings with 2 runs allowed and Altherr and Franco homered in 8-2 win. 77 Mariners Won 26 51 .338 -25 Mark Leiter Ricardo Pinto Hector Neris Down 4-3 in 9th, Joseph ties with homer and Phils win with 2-out walk by Perkins, a balk, and a game-winning single by Knapp. 78 Mets Lost 26 52 .333 -26 Ben Lively Ben Lively Nick Williams makes MLB debut and collects first hit and Lively survived with 2 runs in 6.1 innings, but Phils muster just 4 hits in 2-1 loss. 79 Mets Lost 26 53 .329 -27 Jeremy Hellickson Pat Neshek Tied at 3, Joseph's 3-run homer gave Phils 6-3 lead in 7th, but Hellickson allowed leadoff homer in and Neshek allowed 3 more to score in 7-6 loss. 80 Mets Won 27 53 .338 -26 Nick Pivetta Nick Pivetta Pivetta carried a no-hitter into 5th inning and finished with 1 hit, 4 walks, and 1 run in 7 innings and Phils won 7-1. 81 PIRATES Won 28 53 .346 -25 Aaron Nola Aaron Nola Nola also carried a no-hitter into 5th inning and pitched 7 shutout innings, while Galvis and Franco homered in 4-0 win. 82 PIRATES Lost 28 54 .341 -26 Mark Leiter Mark Leiter Leiter was solid in 5.1 innings, but Phils went 0-for-10 with runners in scoring position in 3-0 loss. 83 PIRATES Lost 28 55 .337 -27 Ben Lively Ben Lively Lively last just 4 innings after 4-run 4th inning and Phils score just twice on Franco homer in first in 5-2 loss. 84 PIRATES Lost 28 56 .333 -28 Jeremy Hellickson Joaquin Benoit Tied at 3 in the 8th, Benoit allowed three runs in 6-3 loss. Jose Osuna gunned down Altherr twice and Herrera once trying to stretch singles. 85 PADRES Lost 28 57 .329 -29 Nick Pivetta Hector Neris Pivetta pitches 3 innings with just 3 solo homers allowed, 9 K's and 0 walks. Phils tied the game at 3 with 2 runs in 7th, but Neris allowed a run in the 9th in 4-3 loss. 86 PADRES Lost 28 58 .326 -30 Aaron Nola Aaron Nola Nola allowed just 2 runs in 8 inninsg, but the Phillies only scored once and Phils lose 2-1. 87 PADRES Won 29 58 .333 -29 Jerad Eickhoff Jerad Eickhoff Phils hit 6 homers, including Williams' first MLB homer and 2 from Galvis, and Eickhoff pitches 5 shutout innings in his first game since DL and gets 1st win of season in 7-1 Phillies win at the break. 88 Brewers Lost 29 59 .330 -30 Nick Pivetta Nick Pivetta After striking out first 4 batters, Pivetta allowed 8 straight batter to reach and score in 8-run 2nd inning, while Altherr was injured in 9-6 loss. 89 Brewers Lost 29 60 .326 -31 Aaron Nola Joaquin Benoit Nola with another strong 6-inning outing and Odubel Herrera homered in third straight game to tie game at 2 in 7th, but Benoit allowed homer in 8th in 3-2 loss. 90 Brewers Won 30 60 .333 -30 Jeremy Hellickson Jeremy Hellickson Hector Neris Williams' first career grand slam all Phils needed as Hellickson allows 2 runs in 5 innings and bullpen allowed nothing in 5-2 win. 91 Marlins Lost 30 61 .330 -31 Jerad Eickhoff Mark Leiter Eickoff allowed three homers, Phils wasted chances late, and lost in 10th on sac fly in 6-5 loss. 92 Marlins Won 31 61 .337 -30 Vince Velasquez Pat Neshek Hector Neris Velasquez sharp in return from DL, allowing 2 runs in 6 innings with 79 pitches, while homers from Franco and Williams pace Phils to 5-2 win. 93 Marlins Won 32 61 .344 -29 Nick Pivetta Nick Pivetta Phillies pound out 20 hits, Williams had 2 triples, Franco knocked in 3, and Phils roll to 10-3 win. 94 BREWS Won 33 61 .351 -28 Aaron Nola Aaron Nola Nola with another dominant outing, going 7 innings with 96 pitches and allowing one run, while a 2-run homer from Galvis and 2-run double by Joseph lifted Phils to 6-1 win. 95 BREWS Lost 33 62 .347 -29 Jeremy Hellickson Hector Neris Hellickson allowed 6 earned runs in 5 innings, but Phils came back with 7 runs to tie in 7th and 8th innings capped by Hernandez's 3-run homer and Rupp's 3-run homer, but Neris allowed a run in 9th in 9-8 loss. 96 BREWS Won 34 62 .354 -28 Jerad Eickhoff Jerad Eickhoff Luis Garcia Williams hit 2-run homer and Phils scored 4 in the 5th, while Eickhoff allowed just 2 runs in 6 innings and Garcia earned save in 6-3 win. 97 ASTROS Lost 34 63 .351 -29 Vince Velasquez Vince Velasquez Velasquez allowed 3 runs in 1st 3 innings to former team and left in the 4th with rain delay and bullpen let in 11 more runs in 14-3 loss. 98 ASTROS Lost 34 64 .347 -30 Nick Pivetta Nick Pivetta Pivetta strong through 5 innings, but allowed 4 runs on 5 hits and 35 pitches in 5-0 shutout loss. 99 ASTROS Won 35 64 .354 -29 Aaron Nola Aaron Nola Nola pitches 6 shutout innings with career-high 10 strikeouts and Rupp hits two 2-run homers in 9-0 win. Neshek traded after game. 100 BRAVES Won 36 64 .360 -28 Jake Thompson Jake Thompson Joaquin Benoit Altherr and Rupp hit back-to-back homers and Joseph added 3-run homer in 7-run fifth, Altherr hit a second homer, and Jake Thompson pitched 5 scoreless innings in 10-3 win. Kendrick and Hellickson traded after game. 101 BRAVES Won 37 64 .366 -27 Jerad Eickhoff Hector Neris Down 3-1, Altherr knocked in a run in the 8th and Herrera homered to tie game in 9th, and Kelly hit walk-off single in 11th. Therrien made major league debut in win. 102 BRAVES Won 38 64 .373 -26 Vince Velasquez Hector Neris Velasquez tossed 7 innings for first time since 16 strikeout game and Galvis made three great defensive plays and singled home a walk-off winner in 2-1 win. 103 BRAVES Won 39 64 .379 -25 Nick Pivetta Nick Pivetta Hector Neris Pivetta allows 1 run in 6 innings, Herrera hit 3-run homer, Joseph knocked in 2, and Franco homered, and Phils held on for 7-6 win to complete first 4-game sweep of Braves at home since 1949 as Boston Braves. 104 Angels Lost 39 65 .375 -26 Aaron Nola Aaron Nola Nola escaped with just two runs in 6 innings despite 8 hits, but bullpen allowed 5 runs and Phils struggled with RISP in 7-1 loss. 105 Angels Lost 39 66 .371 -27 Jake Thompson Jake Thompson Thompson surrendered 3 homers and 7 runs (2 earned) in 3rd inning and Phils were shutout 7-0. 107 Rockies Lost 39 68 .364 -29 Vince Velasquez Luis Garcia Velasquez escaped with just 2 runs in 5 long innings, but a homer off Pinto in the 7th tied game and a run off Garcia in 8th gave Phils 4th straight loss. 108 Rockies Lost 39 69 .361 -30 Nick Pivetta Nick Pivetta Rockies score 8 times off Pivetta in 2.2 innings and Nava's 3-run homer late not nearly enough in 8-5 loss. 109 Rockies Won 40 69 .367 -29 Aaron Nola Edubray Ramos Hector Neris Nola allows just 2 runs in seven innings and Phils were down 2-1 in the ninth when Rupp hit game-winning double in 3-2 win. 110 Braves Won 41 69 .373 -28 Zach Eflin Zach Eflin Hector Neris In Eflin's return from minors, he allowed 2 runs in seven innings, while Odubel Herrera's 2-run golf homer in the 5th helped Phils to 5-2 win. 112 METS Lost 42 70 .375 -28 Vince Velasquez Vince Velasquez Velasquez allows 3 runs and leaves after 1st with numbness in middle finger and Phils no match for deGrom in 10-0 shutout loss. Rhys Hoskins makes MLB debut in LF. 113 METS Lost 42 71 .372 -29 Nick Pivetta Hector Neris Phils score 3 times in first, but Pivetta allowed two homers and 6 runs in 4.2 innings. Hernandez homered to tie game at 6 in 8th, but Neris allowed homer in 9th in 7-6 loss. 114 METS Won 43 71 .377 -28 Aaron Nola Aaron Nola Luis Garcia Nola with another dominant performance, pitching seven innings with just one run on two hits. Phils scored 2 runs in fifth and added insurance run in 8th in 3-1 win. 115 METS Lost 43 72 .374 -29 Zach Eflin Zach Eflin Eflin allowed 4 runs in 5.1 innings, but Phils only scored twice and a rally was cut short when Herrera tagged and went to an occupied 3rd base. Hoskins got first MLB hit and RBI in 6-2 loss. 116 Padres Lost 43 73 .371 -30 Jerad Eickhoff Ricardo Pinto Hoskins hits 1st and 2nd career homers and Eickhoff battled with 2 runs through five innings, but Pinto allowed 5 runs in 2 innings in 7-4 loss. 117 Padres Lost 43 74 .368 -31 Mark Leiter Mark Leiter Leiter allowed 8 runs in 5 innings, but only 4 were earned with 2 errors and other misplays. Hoskins homered again and Alfaro hit first MLB homer in 8-4 loss. 118 Padres Lost 43 75 .364 -32 Nick Pivetta Nick Pivetta Pivetta struck out 8 of the first nine batters he faced, but allowed 3 runs and couldn't record an out in 6th inning, while Phils were shutout on 3 hits by one of worst starters in baseball. 119 Giants Lost 43 76 .361 -33 Aaron Nola Aaron Nola Nola's streak of 10 games with 6+ innings and 2 or less runs end, as he allows 5 in 5 innings, while Rupp and Williams homered in 5-4 loss. 120 Giants Lost 43 77 .358 -34 Zach Eflin Zach Eflin Eflin allows 6 runs against in first 3 innings and leaves after 5 with shoulder soreness. Phillies mustered just 2 hits off Matt Moore with 5+ ERA in 7.1 innings in 10-2 loss. 121 Giants Won 44 77 .364 -33 Jerad Eickhoff Adam Morgan Hector Neris Ty Kelly's pinch-hit grand slam finished off 7-run sixth. Eickhoff allowed 4 runs in 4.2 and Ramos allowed 5 runs in ninth, but they held on in 12-9 win. 122 Giants Won 45 77 .369 -32 Ben Lively Adam Morgan Hector Neris Lively allowed 2 runs in 6 innings, and a 3-run 8th helped Phils to 5-2 victory. 123 MARLINS Lost 45 78 .366 -33 Aaron Nola Aaron Nola Phils hit 4 homers, but it was not enough as Nola allowed 7 runs and 3 homers in 6.1 innings in 8-2 loss in game 1 of doubleheader. 124 MARLINS Lost 45 79 .363 -34 Nick Pivetta Nick Pivetta Pivetta throws 44 pitches in first and last just 1.1 innings with 6 runs allowed. Phils hit three more homers, but lose 7-4 in game 2. 125 MARLINS Won 46 79 .368 -33 Mark Leiter Mark Leiter Leiter carried no hitter into sixth inning and allowed just 1 hit in 7 innings, while Hoskins homered, doubled, and knocked in 5 in 8-0 win. 126 MARLINS Lost 46 80 .365 -34 Jake Thompson Luis Garcia Homers by Hoskins and Joseph helped Phils to 8-3 lead after 4, but Thompson allowed 5 runs in 5 innings and bullpen allowed 4 more, including inside-the-parker in 9-8 loss. 127 CUBS Won 47 80 .370 -33 Jerad Eickhoff Jerad Eickhoff Phils score 6 times in first two innings behind Hoskins MLB record 9th homer in first 16 games and bases clearly triple by Hernandez, while Eickhoff allowed 1 run in 5 innings and bullpen gave up nothing in 7-1 win. 128 CUBS Lost 47 81 .367 -34 Ben Lively Ben Lively Hoskins homers again to become quickest to 10 homers, but Lively tagged for 6 runs in 5 innings and bullpen allows 11 more in 17-2 defeat. 129 CUBS Won 48 81 .372 -33 Nick Pivetta Nick Pivetta Pivetta allowed 3 runs in 38-pitch 1st but allowed no more in 5 innings, while Williams' homer capped 5-run 5th. Hoskins homered again and started triple play in 6-3 win. 130 BRAVES Won 49 81 .377 -32 Aaron Nola Aaron Nola Hoskins homer streak ends, but Phils scored 6 times and Nola allows just one run on 5 hits in 7 innings in 6-1 win. 131 BRAVES Lost 49 82 .374 -33 Jerad Eickhoff Jerad Eickhoff Eickhoff allowed 6 runs in 2 innings before leaving with injury and Phils scored just one run off Dickey in 9-1 loss in game 1 of doubleheader. 132 BRAVES Lost 49 83 .371 -34 Mark Leiter Mark Leiter Leiter was solid with 3 runs in 6.2 innings, but Phils got just 6 hits in 5-2 loss in doubleheader sweep. 133 Marlins Won 50 83 .376 -33 Ben Lively Ben Lively Hector Neris Lively gave up 2 runs in six innings and drove in 2 in decisive 4th inning in 3-2 win. 134 Marlins Won 51 83 .381 -32 Nick Pivetta Juan Nicasio Hector Neris Pivetta struggeld in first but escaped with 1 run and allowed no more in 6 innings, while rbis from Alfaro and Blanco in 9th gave Phils 2-1 win. Juan Nicasio recorded one out in his Phillies debut to earn win. 135 Marlins Lost 51 84 .378 -33 Aaron Nola Aaron Nola Marlins tagged Nola for 6 runs and 2 homers in 5 innings, and homers from Hoskins and Joseph, and late 5 run rally weren't enough in 10-9 loss. Florimon left after gruesome ankle injury and Hoskins left with sore hand. 136 Marlins Won 52 84 .382 -32 Jake Thompson Adam Morgan Hector Neris Jake Thompson delivered 6 innings of one run ball and Nick Williams' two run single in the 12 inning gave Phillies 3-1 win. 137 Mets Lost 52 85 .380 -33 Mark Leiter Mark Leiter Leiter allowed 9 runs in 3.1 innings and Phils score 7, but it wasn't enough in 11-7 loss. 138 Mets Won 53 85 .384 -32 Ben Lively Ben Lively J.P. Crawford made MLB debut, Ben Lively allowed 1 run in 7 innings, hit two-run homer, and knocked in 4 as Phils rolled to 9-1 win. 139 Mets Lost 53 86 .381 -33 Nick Pivetta Nick Pivetta Mets scored 6 runs off Pivetta in 5 innings, and Williams' two-run homer in 6th wasn't enough and game was called after 6 innings in 6-3 loss. 140 Nats Lost 53 87 .379 -34 Aaron Nola Adam Morgan Phils took 3-1 lead with homers from Alfaro and Joseph, but a 3-run sixth against Nola and Morgan gave Nats 4-3 win. 141 Nats Lost 53 88 .376 -35 Jake Thompson Jake Thompson 3-run homer by Williams gave Phils 3-0 lead, but sloppy defense and an inside-the-park grand slam gave Nats 7-3 lead. Phils hit two more 3-run homers, but it wasn't enough in 11-10 loss. 142 Nats Won 54 88 .380 -34 Mark Leiter Mark Leiter Hector Neris Hoskins and Franco homered, while Leiter allowed 4 runs in 6 innings and bullpen strong in 5-4 win. 143 Nats Lost 54 89 .378 -35 Ben Lively Ben Lively Lively scattered 6 hits in 8 innings, but 2 runs against was more than enough for Strasburg's 8 scoreless innings and rally came up short in 3-2 loss. They tied franchise record for most one-run losses. 144 MARLINS Won 55 89 .382 -34 Nick Pivetta Edubray Ramos Down 7-2, Phils scored 4 runs in 7th and 8th. Kim tied game with single in 9th and appeared to have walk-off run too, but call was overturned. Neris gave up run in 10th, but with bases empty and 2 outs, Hoskins hit 2nd homer to tie the game in 10th and Williams hit walk-off hit in 15th. 145 MARLINS Won 56 89 .386 -33 Aaron Nola Aaron Nola Hoskins hit 17th homer in 33 games, Herrera homered, and Phils scored 10 runs for Nola, who struck out a career high 11 batters in 7 innings in 8-1 win. 146 MARLINS Won 57 89 .390 -32 Jake Thompson Jake Thompson Phillies hit 3 homers, including Hoskins' 18th in 34 games and Thompson tossed 5.1 scoreless innings in 10-0 win. 147 A'S Lost 57 90 .388 -33 Mark Leiter Mark Leiter Daniel Mengden shut down Phils with first career shutout, while Leiter allowed 4 runs in 6 innings in 4-0 loss. 148 A'S Won 58 90 .392 -32 Ben Lively Victor Arano Hector Neris Rain shortened Lively's night to 3 innings with 2 runs, but Alfaro's 2-run homer broke tie and Phils won 5-3. 149 A'S Lost 58 91 .389 -33 Henderson Alvarez Henderson Alvarez Henderson Alvarez allowed 2 runs entering 6th in Phillies debut, but issued two baserunners before Ramos allowed grand slam in 6-3 loss. 150 DODGERS Won 59 91 .393 -32 Nick Pivetta Nick Pivetta Hector Neris Pivetta allowed 2 straight homers (one inside the park) in first, but settled down and allowed nothing else in 6 innings, while Aaron Altherr hit first ever grand slam off Kershaw in 4-2 win. 151 DODGERS Won 60 91 .397 -31 Aaron Nola Aaron Nola Nola allows 2 runs in 7 innings and Hoskins hit 3-run double in 7th to give Phils lead and finished with 4 RBI in 6-2 win. 152 DODGERS Won 61 91 .401 -30 Jake Thompson Luis Garcia Hector Neris Altherr belted game tying 2-run homer in 7th and go ahead 2-run single as Phils win third straight against Dodgers. 153 DODGERS Lost 61 92 .399 -31 Mark Leiter Ricardo Pinto Leiter with strong six innings and held lead in 6th, but Pinto allowed 2 runs in seventh and couldn't complete sweep of MLB's best team in 5-4 loss. 154 Braves Lost 61 93 .396 -32 Ben Lively Ben Lively First six Braves recorded hits and Braves scored 5 runs in first. Phils unable to recover in 7-2 loss. 155 Braves Lost 61 94 .394 -33 Henderson Alvarez Luis Garcia Phils led 2-0 after five shutout innings from Alvarez, but Braves scored 1 in the 6th and three times in 8th in 4-2 loss. 156 Braves Won 62 94 .397 -32 Nick Pivetta Nick Pivetta Hector Neris Pivetta delivers 6 shutout innings and Franco's solo homer and Alterr's RBI double all Phils needed in 2-0 win. 157 NATS Lost 62 95 .395 -33 Aaron Nola Aaron Nola Nola allowed just 2 runs in 6 innings, but Phils scored just once on Herrera homer in 3-1 loss. 158 NATS Won 63 95 .399 -32 Jake Thompson Jake Thompson Hector Neris Rupp's knocked in 2 in 3-run 3rd, Thompson allowed 1 run in 5 innings, and bullpen tossed 4 scoreless in 4-1 win. 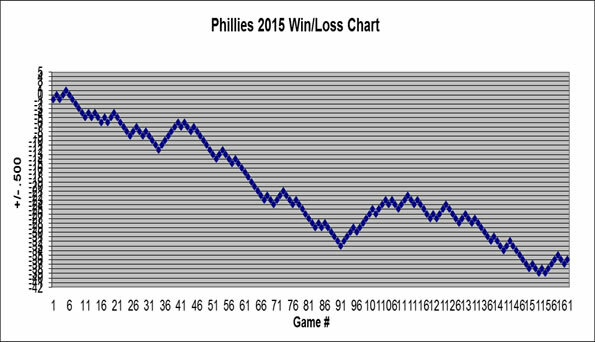 Phils avoid 100 losses with win. 159 NATS Won 64 95 .403 -31 Mark Leiter Yacksel Rios Leiter struggled with 5 runs in 4.1 innings, but 2-run double by Alfaro and 2-run triple by Altherr helped Phils to 7-5 win. 160 METS Won 65 95 .406 -30 Ben Lively Ben Lively Pete Mackanin fired before game but remained as manager, and watched homers by Franco, Alfaro, and Hernandez, with 2 runs in 6 innings from Lively in 6-2 win. 161 METS Lost 65 96 .404 -31 Henderson Alvarez Adam Morgan Franco homered, and Hoskins tied the game at 4 in the 7th, but Morgan allowed a 3-run homer in the 11th in 7-4 loss. 162 METS Won 66 96 .407 -30 Nick Pivetta Nick Pivetta Franco homered and Phils scored 6 runs in the 4th, Pivetta pitched 5 shutout innings and bullpen blanked Mets for the rest, and Nick Williams hit an inside the park homer with one out left in the season in 11-0 win.